From pizza and seafood to international cuisine and home-style cookin’, Branson’s buffet restaurants offer meals for every palate and prices that are easy to swallow. Of course, when you visit one of Branson’s buffet restaurants, you want to go in hungry. Fortunately, with so much to see and do in Branson, especially outdoors, working up a healthy appetite is rarely a problem. India Clay Oven – One of Branson’s top-rated restaurants (via TripAdvisor reviews) offers a lunch buffet so you can sample a variety of dishes in case you don’t already have a favorite. Golden Corral Buffet – You'll find more than 200 dinner choices on the regular buffet and 100+ choices on the weekend breakfast buffet. Singer Barbara Fairchild performs in the dining room Tuesday-Friday. Grand Country Buffet – Roast and hand-carved ham are a staple on the dinner buffet menu at this popular eatery inside the Grand Country Resort. 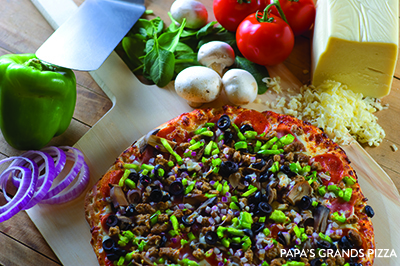 Papa Grand’s Pizza, also inside Grand Country Resort, has a variety of pizza options and delicious desserts on its buffet, too. Starvin’ Marvin’s – Seafood is the focus of this tempting buffet, with crab legs the specialty and catfish also a favorite among guests. Cajun music adds to the atmosphere. Cici's Pizza - Well known for their pizza baked with home-made dough, made daily right here in Branson, Cici's is a great family buffet option. You can choose from many different selections of pizza, wings, and desserts. The arcade located inside is also exciting entertainment. Jackie B. Goode’s Uptown Café – This retro-style diner is noted for its classic 1950s décor and an excellent breakfast buffet that includes staples such as bacon, eggs, sausage and biscuits, with extras like cinnamon rolls and grits. Whether you come for breakfast, lunch or dinner, there’s live entertainment. Panda House - With it's comfortable and welcoming atmosphere, Panda House has many different options at a reasonable price. Beef, chicken, and pork dishes are most popular; however, noodle dishes and seafood options are available as well. Hong Kong Buffet - This family owned/operated restaurant has many different dishes for everyone. They are the first and longest standing Chinese buffet in Branson. From cashew chicken and orange chicken, to peppered steak and moo goo gai pan, Hong Kong Buffet will leave you feeling very full. 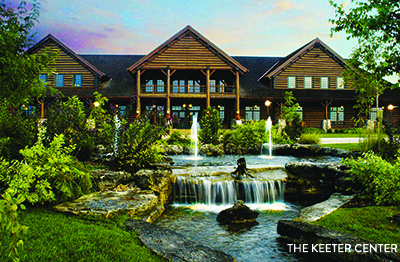 Keeter Center at College of the Ozarks – When you check out the Sunday brunch buffet at Hard Work U’s restaurant, you may not know where to begin. Carved meats, hot entrees, made-to-order waffles – it’s all here and it’s all good. Note the restaurant is closed until March 2017 for renovations. Check their website for updates. The next time you explore Branson, leave the cooking to someone else and check out these buffets – and others – for yourself. Your stomach and your pocketbook will thank you.